Cut the fondant off the edges and slice into thin layers. Use a cookie cutters to cut the slices into circles. Mine should have been smaller, but I had to use the smallest ones I had on hand. 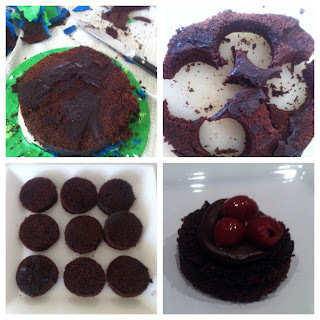 Then on top of each circle, I piped some chocolate ganache (left over from the cake making extravaganza also) around the outside of the cake, popped a few cherries in the middle. Squirt some whipped cream on top and sprinkle with some nuts. Set the scraps of the circles aside (I put them in zip lock bag in the freezer for later use) and you could turn them into a trifle to be even thriftier.